Thanks to MEA Second Vice President Beverly Shea for the coordinating the great lineup of performers and repertoire for the 2018 Teachers’ Master Class! We were fortunate to hear Mozart, Chopin and Schubert works played by three of our fine MEA pianists, with violin and cello joining for a Shubert Trio treat. President Nancy Modell introduced Mr. Jerome Lowenthal as our wise, thoughtful and caring Master Class teacher, and complimented this morning’s brave musicians for volunteering to perform. On to the Rondeau! Mr. Lowenthal encouraged playing the opening in a way that “gets a conversation going. Try a question and answer style of playing, and give the conversation a chance to breathe.” He demonstrated the three-chord statement this way: “I would play this as a ‘now good-bye’ phrase,” playing the first chord on the word now, the second chord on good, and the third chord on bye. Observing the swift runs, he noted, “You have terrific fingers; don’t let them tell you how to play.” Nearing the end of the movement he advised, “I would exploit the dramatic color of the minor here. 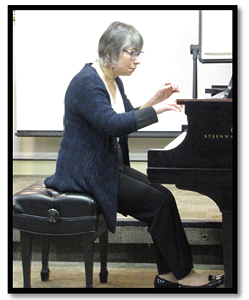 In Mozart, the difference between major and minor, … it’s an important thing, always.” Mr. Lowenthal thanked Helen and the audience applauded her for her excellent performance. Then he stated humorously, “The person who wrote ‘Start less here’ [over the crescendo in the score] is somebody I agree with.” Expanding, he noted, “The rule is: when you see the word crescendo, get softer; when you see diminuendo, get louder; when you see accelerando, get slower; and when you see ritardando, get faster.” Later we were reminded “Chopin is very specific in his manuscripts, so when you see it, do it! It’s a question of harmonic logic.” As Florence worked through score, trying out his onthe- spot musical suggestions, he often remarked of her playing, “That was beautiful. That was terrific!” He concluded by explaining Chopin’s musical intent for the end of the movement. “He wants f, then ff. 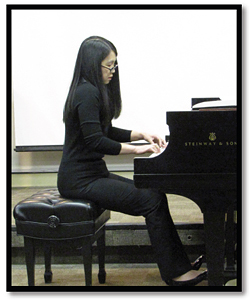 The final chord ending with the third on top gives a feeling of going on [to the next movement].” Florence received enthusiastic applause for her wonderful playing. He offered some suggestions to keep in mind when performing this work. Commenting that Shubert’s notation is notorious for showing no differentiation between accents and diminuendo, he said, “Accents are very important, so you have to make your own decisions. On the other hand, don’t make accents where they are not.” He noted the string players were “making the accents very well” and suggested just removing some of the added accents. To achieve a better sound balance between the piano and strings, he asked rhetorically “Do I think you should close the piano? No, I think you should open the piano! This is a piece written for piano, violin, and cello, so if you close the piano it mutes the sound.” He went right to it, lifting the Steinway lid to full open, then worked with the group on achieving that balance. “I don’t hear you enough” he said to the violinist at one point, and the players worked together to adjust the piano and cello volumes there. When the melody moved to the cello, he reminded us that the piano provides the harmonic support in a trio. The trio worked on that together, and Patricia provided that support resulting in a beautiful interpretation of the passage. He also suggested players listen a bit more to each other, adjusting the balance as the melody moves from one instrument to another. He gave us a quick theory lesson on the augmented 6th chord at the end of the movement, “which is, in a way, the most important chord in music. 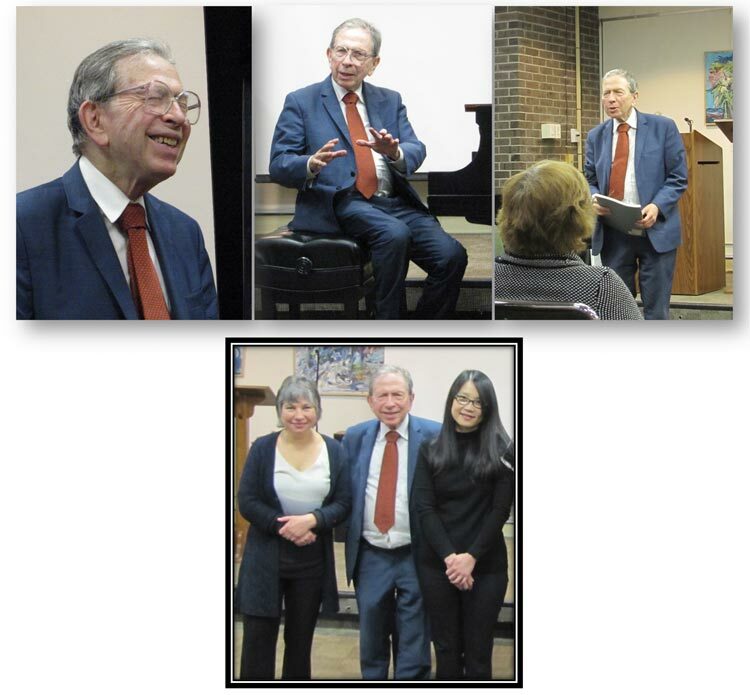 It’s the [tantalizing] chord that both the Classical and Romantic composers use when they want to say something special.” The audience applauded and thanked Patricia, Millie and Randy for a wonderful performance. The meeting finished on a lighthearted note as Mr. Lowenthal spoke of a universal concern for musicians. “Ladies and gentleman, when you have learned a wrong note, it’s yours for life. You’ll never get rid of it; 50 years from now you’ll still play the same note, unless you say to yourself ‘No, no, I will not play that damn note again!’” The audience laughed and applauded knowingly, as the room was filled with musicians who have all been there! Beverly ended the session with the ever-fun surprise singing of Happy Birthday to our Master Teacher, in honor of his February 11th birthdate. The impromptu audience-turnedchorus sang with gusto, and Mr. Lowenthal was gracious in his thanks to all. After the meeting, members and guests enjoyed socializing and conversing with the players, Master Teacher Lowenthal, and other attendees. We thank Hospitality Chair Karen Dann Sundquist for providing the refreshments. Bravo MEA Master Class teachers! Kudos for your wonderful performances! We were lucky folks to be in the midst of such great music and musicians.